Not many people gave the Philadelphia Eagles much hope last season after Carson Wentz went down with a torn ACL during Week 14, but the team pulled together and ended up capturing their first Super Bowl title in franchise history. The team responsible for the 41-33 win over the New England Patriots received their official Super Bowl rings at a special ceremony on Thursday night and they are absolutely stunning. The rings is made of pure 10-karat white gold and includes 219 diamonds and 17 green sapphires, but there’s a lot of small details that went into the creation of the team’s first Super Bowl champions ring in franchise history. 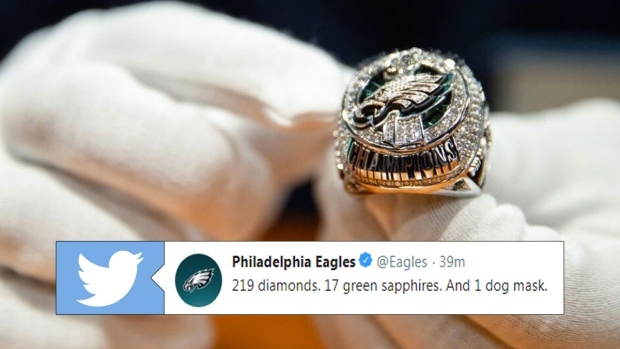 The Eagles logo on the front of the ring is made up of 52 pavé-set diamonds in honour of the win coming at Super Bowl 52, while the Lombardi Trophy contains 16 diamonds to represent the team’s victory total in 2017. The base of the trophy is made up of 13 diamonds to represent the franchise-record-tying 13 regular season wins, while the top of the Lombardi Trophy is made up of three diamonds which represent the three postseason victories. The top of the trophy also includes a marquise-cut diamond to represent the first Super Bowl title, while the waterfall of 127 diamonds pays tribute to the “Philly Special” as it represents the sum of the jersey numbers of the three players who handled the ball on the trick play. The ring also includes four green sapphires to represents the franchise’s four NFL championships (1948, 1949, 1960 and Super Bowl LII), while the inside includes a dog mask in honour of their role as the underdogs. The bottom of the inside arbor includes each player’s signature, and also includes “We All We Got, We All We Need” and the word “family”. We all we got. We all we need.